When I entertain I love to start the meal with a small bowl of soup. It's something to wet the appetite, and it always complements the flavours of the meal to come. It may be a creamy vichyssoise in the summer, or roasted red pepper soup, topped with cool sour cream. In the winter it's most likely a hearty vegetable beef soup made with roasted beef bones which I always keep in the freezer, or a flavorful and fun fish stew. Whatever the season, soup is the perfect first course. 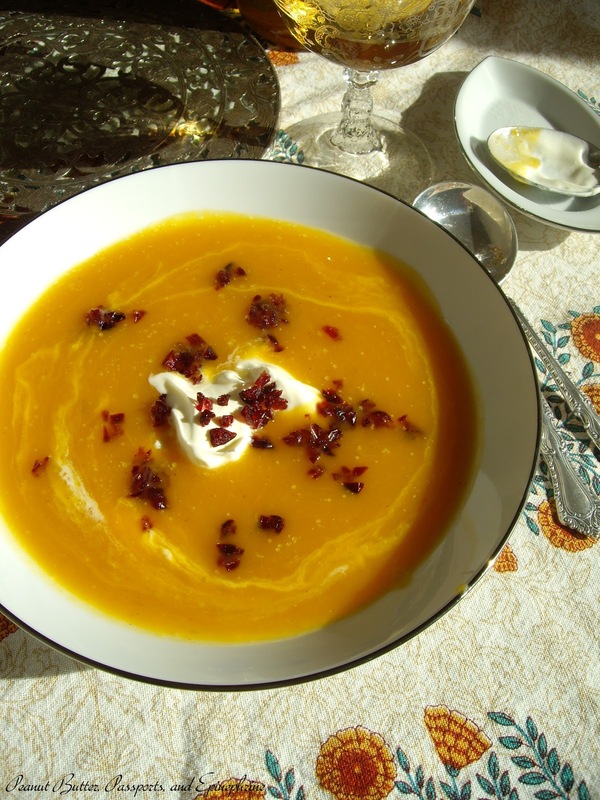 As I was planning my Thanksgiving menu this year I wanted to include a warm, fall soup that was a little different than our normal Thanksgiving fare. I finally decided on this simple Butternut Squash Bisque. To make it festive it's topped with an exquisite crème fraîche from a local dairy, and garnished with a sprinkling of chopped, dried and sweetened cranberries for a burst of unexpected sweetness. This bisque combines some of the most iconic flavours of fall: apples, cinnamon, and cranberries. It is an easy autumn lunch or dinner with a ham and gruyère panino. And the beautiful thing about it is that it's better the next day. Make it the day before Thanksgiving and store it in the refrigerator. Simply reheat it on the back burner (or in the slow cooker if you need more space) and you'll have a fabulous Thanksgiving starter. And one less thing on you Thanksgiving day to-do list is always something to be thankful for! Heat the oil in a large stock pot over medium heat. Sauté the leeks for 1 - 2 minutes. Add the squash and apples and cook, stirring occasionally for 5 minutes. Add the salt and cinnamon and stir to coat. Add the broth and bring to a simmer. 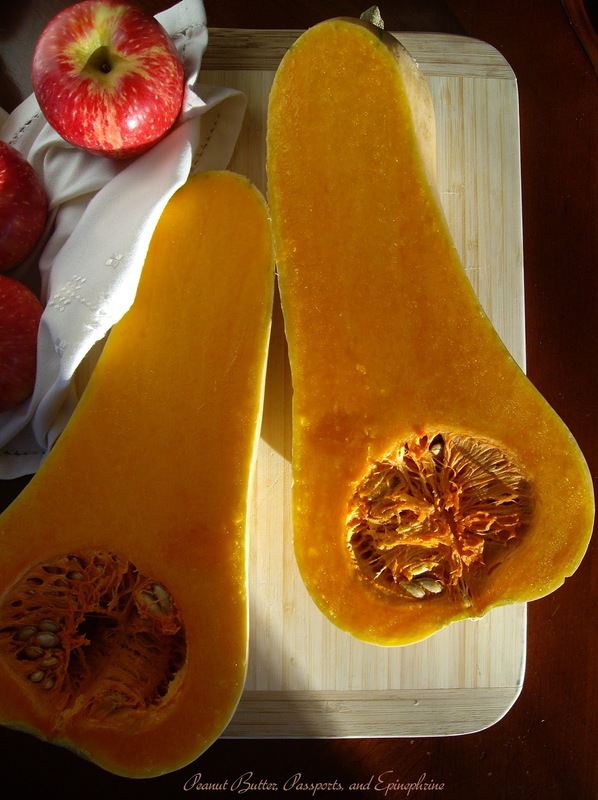 Cover and simmer on medium-low heat for 40 - 45 minutes, until the squash is very soft. Run the soup through the fine blade of a food mill, or purée it in the blender until smooth. (If using the blender please don't forget to remove the centre portion of the lid and cover the lid loosely with a clean kitchen towel leaving room for the steam to escape.) Taste for seasoning. At this point the soup can be stored in the refrigerator for a day or two and reheated on the stove top (or in the slow cooker on high). Serve hot with a tablespoon-sized dollop of crème fraîche and a sprinkling of the chopped cranberries. Serves 8 - 10 as a first course.